Hydro is a global aluminium company, with operations in most EU countries. Aluminium is used in a wide range of applications – in particular in packaging, transportation, construction and consumer products – and recycling plays a crucial part in its life cycle. Aluminium is a perfect example of a circular economy material: it can be recycled over and over again without losing its properties. Hence 75% of all aluminium ever produced is still in use. Its recycling has one outstanding advantage: only 5% of the energy required to produce primary aluminium is needed to recycle it. However, aluminium recycling is more efficient the higher the quality of sorting of waste. This is the reason why Hydro heavily invests in sorting technologies. 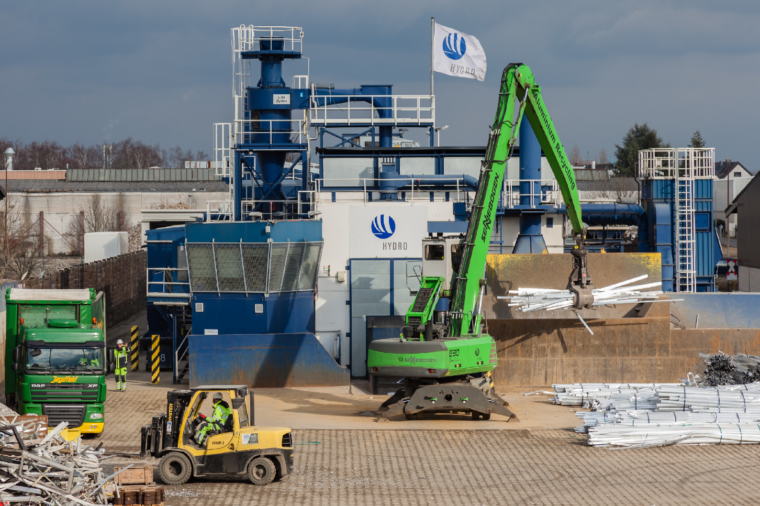 Hydro’s aluminium scrap sorting plant in Dormagen, Germany, can boast with the most advanced aluminium scrap sorting technology in the world. Utilizing x-ray transmission and several other sorting technology elements, the plant can sort up to 36,000 tonnes of aluminium scrap per year. 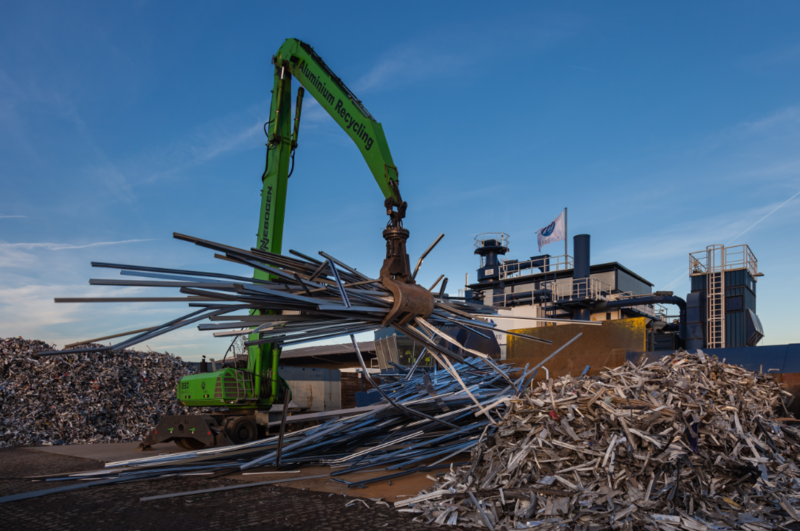 The sorting plant supplies Hydro’s recycling plants in Europe with shredded and sorted post-consumed aluminium scrap. The recycling plants, in turn, are able to produce the specific aluminium alloy compositions that customers require. For example, the Dormagen plant is a key player in the German A|U|F end-of-life windows collection program. It feeds the Hydro recycling plant Clervaux in Luxembourg, which produces billets exclusively made from recycled windows. Efficient recycling. Using efficient sorting technology for scrap is of key importance for closed loop recycling concepts. Only when the scrap is sorted effectively, the positive recycling properties of aluminium can be utilized to the full extent. Recycling in a remelt facility need full control over the inputs into the furnaces. Too much impurities in the recycling materials limit the final range of applications. Technology transfer. Hydro’s plant for recycling of aluminium cans which started its operation close to Dormagen in 2015, uses several of the patented technical processes from the Dormagen plant and thus, the plant can sort up to 36,000 tonnes of aluminium scrap per year. Innovation cluster. In the Neuss area in North Rhine-Westphalia state, Hydro is running the biggest aluminium cluster in Europe. In addition to the Dormagen plant we find the primary aluminium plant and remelter in Rheinwerk, the rolling mill Alunorf (joint venture), and the finishing mill in Grevenbroich. All activities are supported by the largest aluminium R&D center in Europe, based in Bonn. The primary production of aluminium is power intensive, and EU legislative costs linked to the power cost, such as CO2 costs, weaken global competitiveness. This limitation affects also regional innovation and development in recycling, as success is dependent on quality throughout the value chain. On the other hand, it is an opportunity to develop unique recycling technology which significantly reduces energy consumption while bringing aluminium products back to the loop. Dormagen received a funding from the German state for saving more than 200,000 t of CO2/year. Innovation process is slowed down by bureaucracy and long application processes. Each technical change needs a permit update or even a new permit also for smaller changes. Often it takes 2-3 years until a permit is secured and recyclers can implement their inventions. End-of-Waste Regulation. Scrap in the European Union is listed as waste and divided into different waste categories related to the original use. When waste crosses European borders, green waste contracts must be signed by the recycler and the seller. Some years ago, the European Union published the end-of-waste criteria specifying when certain waste ceases to be waste and obtains a status of a product (Article 6(1) and (2) of the Waste Framework Directive 2008/98/EC). With today’s recycling and sorting capabilities, most of the recycled materials should no longer be defined as waste and should be transported as products.